One of my friend asked about the difference of COPD and Asthma. Let me explain about COPD. 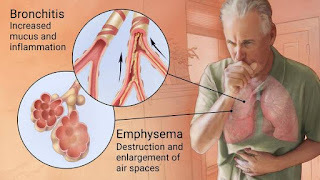 It is an umbrella term used to describe progressive lung diseases including emphysema, chronic bronchitis, refractory (non-reversible) asthma, and some forms of bronchiectasis. This disease is characterized by increasing breathlessness. COPD affects an estimated 24 million individuals in the U.S., and over half of them have symptoms of COPD and do not know it. Early screening can identify COPD before major loss of lung function occurs. 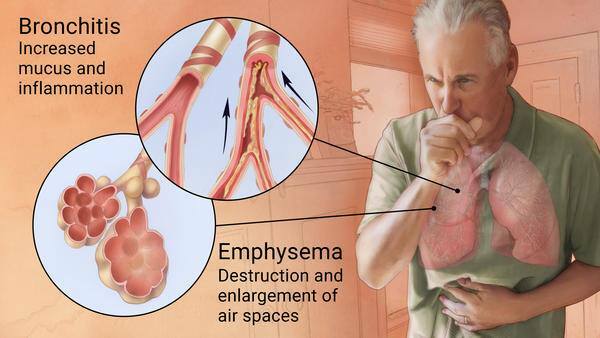 What are the risk factors and common causes of COPD? Most cases of COPD are caused by inhaling pollutants; that includes smoking (cigarettes, pipes, cigars, etc. ), and second-hand smoke. Fumes, chemicals and dust found in many work environments are contributing factors for many individuals who develop COPD. Genetics can also play a role in an individual’s development of COPD—even if the person has never smoked or has ever been exposed to strong lung irritants in the workplace. COPD most often occurs in people 40 years of age and older who have a history of smoking. These may be individuals who are current or former smokers. While not everybody who smokes gets COPD, most of the individuals who have COPD (about 90% of them) have smoked. COPD can also occur in those who have had long-term contact with harmful pollutants in the workplace. Some of these harmful lung irritants include certain chemicals, dust, or fumes. Heavy or long-term contact with secondhand smoke or other lung irritants in the home, such as organic cooking fuel, may also cause COPD.